Considering how much money you've doled out for iPhones, computers, and other Apple products and services over the years, the introduction of an all-new, branded credit card from the company feels a tad on the nose. That's not to say that the new credit card -- simply dubbed Apple Card -- isn't still a compelling addition to the long and often confusing list of rewards credit cards out there, both in the way it helps you earn perks and how it works. Here's everything you need to know about the new card, including the slick laser-etched titanium physical version that's sure to catch people's eyes. 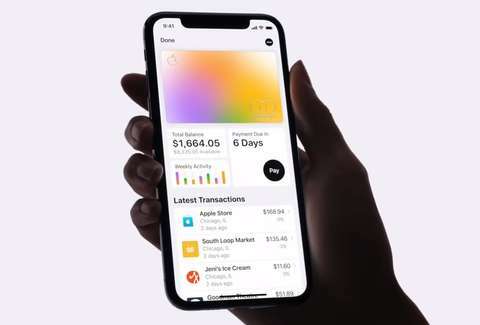 Apple first announced the credit card, issued in partnership with Goldman Sachs, during its much-hyped "It's Showtime" event at the Steve Jobs Theater in Cupertino, California on March 25, confirming rumors and speculation that's been buzzing in recent months. In keeping with the brand's grand tradition of hyping its new devices as game-changers, the company proclaimed that Apple Card "transforms the entire credit card experience" and that it's "built on simplicity, transparency, and privacy." But is that true? Unlike traditional cards, this one will live right in your iPhone's Wallet app, can be signed up for in minutes, and can be used as a digital card anywhere Apple Pay is accepted. The physical titanium card is also quite different from what you may be accustomed to, coming etched with the user's name but not sensitive data like a credit card number CVV, expiration date, or signature. Instead, all of that authorization info is stored in the Wallet app. While the fact that the card exists both in digital and physical forms may all seem a bit confusing, it's really not. As long as where you're shopping -- online or in real stores -- accepts Apple Pay, you'll be able to pull up the digital version on your iPhone and complete the transaction. If Apple Pay isn't supported, you'll be able to use the physical version instead (Mastercard handles payment processing). In either case, you'll also be able to get a comprehensive and at-a-glance view of your purchases immediately right on your iPhone. Specifically, Apple says you'll be able to quickly see when your monthly payment is due, how much you owe, and even get a Maps view of where you've made purchases. You'll also be able to see how much you've spent in a given week or month, for instance, and track spending by category, which could potentially make budgeting a bit easier. What are the cash back deals for Apple Card? Rather than a points system you may be familiar with from other rewards credit cards, Apple Card will offer a cash back perk program that the company has dubbed Daily Cash. Essentially, you'll earn cash back on every transaction -- 1% when using the physical card, 2% when using the digital version, and 3% when purchasing anything from Apple using the digital version -- and have access to it right away. So, for example, if you spend $1,200 at Apple in a single transaction using Apple Card you'll receive $36 instantly in Apple Pay Cash. You can use it in any way you want, even to pay down a balance. What are the fees associated with Apple Card? Apple says there are no late fees, annual fees, international fees, or fees for going over your limit with Apple Card. However, as CNBC points out, the company has quietly rolled out some new transfer fees that are worth keeping in mind. For example, Apple will charge a 1% fee to make an instantaneous transfer from your Apple Pay Cash balance to a debit card (though it maxes out at $10). How do you apply for Apple Card? While Apple says its new card will be available starting this summer, the exact launch date is not yet known, so you can't actually apply for one just yet. However, if you'd like to be among the first to do so, you can sign up to be notified once it's available. It's also not yet clear who'll qualify to receive an Apple Card, though you will need to be approved. But considering APRs will range from 13.24% to 24.24% depending on creditworthiness, credit card industry analyst Ted Rossman told CNBC he believes Apple will likely be making it available to a wide range of users, including people with bad credit. How is the Apple Card different from Apple Pay? While Apple Pay has been around since 2014, it essentially serves as a way to tether an existing physical credit or debit card and pay for things digitally using funds from that account via your device. The Apple Card, meanwhile, becomes the credit card itself, and provides the line of credit. Still, the digital transaction process will function in the same exact way for both Apple Card and Apple Pay (e.g., you need to authenticate each purchase via FaceID or TouchID). Of course, Apple Card also comes with a physical titanium version.